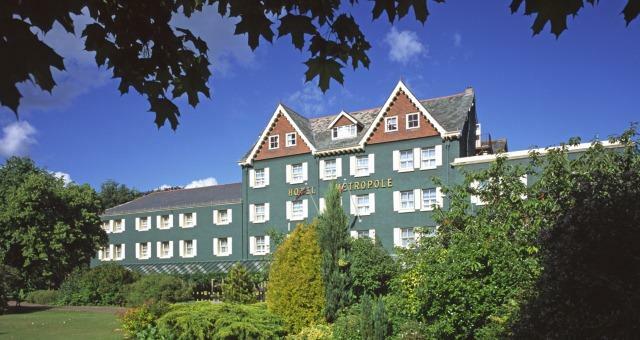 The Metropole Hotel01597 823700work HotelThe Metropole Hotel is located in the beautiful Spa town of Llandrindod Wells in the heart of Mid Wales and is renowned for its' warm and friendly atmosphere, comfortable accommodation and superb cuisine. Privately owned and run by 5th generation family for over 120 years, it is the perfect venue for a wedding, events, groups, spa days, afternoon teas and short breaks in Wales. The hotel has 100+ ensuite bedrooms all with, TV, tea making facilities, bath/shower, room service and a wide selection of rooms ranging from Classic, Wheelchair access, Superior through to luxury tower suites. Hotel facilities include car parking with spaces for 150 cars, electric vehicle charging points and plenty of room for coaches. Staff are on reception 24/7, porter service and lifts servicing all floors - an accessible location for all visitors.. The hotel facilities include an indoor leisure complex with its 18 metre indoor pool, whirlpool spa, sauna, steamroom and gym is an ideal environment in which to relax. Float your cares away in our 18m heated swimming pool with thermal whirlpool spa and cleanse your system in the heat of the sauna and steam room. Combine with our carefully selected luxury treatments from highly trained therapists – just what your body and mind needs to relax and unwind. Guests are invited to get their circulation going in smart, air-conditioned gymnasium, fully equipped with the latest aerobic and cardiovascular equipment or treat yourself with soothing facials, massage, body scrubs and wraps. A superb three course menu is available each evening, served in the elegant surroundings of our Restaurant and Conservatory or, for a relaxed, contemporary atmosphere, enjoy an informal yet delicious dining experience in Spencer’s Bar and Brasserie. The Metropole Hotel is located in the beautiful Spa town of Llandrindod Wells in the heart of Mid Wales and is renowned for its' warm and friendly atmosphere, comfortable accommodation and superb cuisine. Privately owned and run by 5th generation family for over 120 years, it is the perfect venue for a wedding, events, groups, spa days, afternoon teas and short breaks in Wales. The central Mid Wales location and ease of parking in the large, free car park make this the ideal choice for that important business meeting or larger conference.The Metropole can host small meetings for six people as easily as a large conference of 300. There are 14 separate function rooms available and our variety of room size allows almost any configuration of seating. Some allowed in some areas. Children welcome from any age. If you are coming from the south the best route is over the second Severn Bridge and up the A449 then A40 to Abergavenny. This is all Motorway or Dual carriageway. It is about 45 miles to Llandrindod from Abergavenny. On Arrival at The MetropoleOur Car Park is at the rear of the Hotel accessed off Beaufort Road. The Car Park is flat and level Four Disabled Bays are available by a side entrance to the hotel There is an Automatic Door from the Car Park into the Hotel. A lift will take you from car park level to the main body of the Hotel. Lift width 1100 mm You may park at the front entrance of the hotel to drop off luggage or passengers A porterage service is available for help with luggage If arriving by train we can order a taxi for guests with advance notice Checking InOnce inside the hotel there is access to reception on ground floor with no steps or ramps The reception desk may be too high for those in a wheel chair, if this is the case an alternative table is provided We do not have a hearing loop at reception The Ground FloorMost of the ground floor is on one level, including the bar, reception, lounges, dining room and most meeting rooms The bar may be too high for those in a wheel chair, if this is the case a waiter service will be offered Lounges and corridors on the ground floor are well lit with good colour contrast Both the ground floor and the David Spencer Suite have toilet facilities for those with specific needs. Bedrooms3 lifts runs to all floors. The lifts do not have audio but it do have raised buttons. Only one lift is suitable for wheelchair users and this does service all floors. Lift width 900mm A banister runs all the way up the stairs to each floor on the right hand side of the stairs Corridors have good colour contrast and are well lit Bedrooms are on 4 floors. These floors do contain stairs to some rooms therefore please make clear at the time of your reservation that you would require level access to your bedroom. Bedroom lighting is of different light levels Non-feather or synthetic pillows are available on request A raised toilet seat is available upon request Bathroom Stools are available upon request for use in a shower The fire alarm is audio only h owever systems have been put in place to ensure the safe exit of all guests in the case of an emergency. If you have any concerns on this issue our Duty Manager will be pleased to talk to you about these procedures. 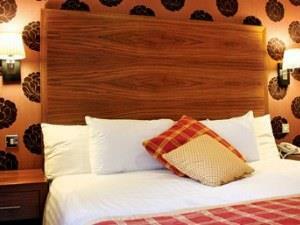 There are two fully accessible bedrooms near the main lift with en-suite facilities for wheelchair users. The Dining RoomMost diets can be catered for by prior arrangement A table near the door in the dining room can be arranged for easy access Chairs are non fixed in the dining room Chairs with arms are available in the dining room on request. A large print menu is available on request. Other InformationThe hotel has one wheel chair, and with prior notice, can obtain a further wheelchair to be on site Guide dogs are welcome Reception is manned 24 hours a day Room service is available to any guests wishing to have meals in their rooms The hotel has no signs or literature in Braille The leisure complex is currently only accessible via 5 steps. TrainingAll Directors, Managers, Head of Department and many front of House staff attended a training Course entitled, 'Getting it Right! Providing a service of equality.' The course aims were to: Increase general awareness by exploring the attitudes and behaviour that impact on societys perceptions of disabled people. Give a deeper understanding of the barriers that prevent disabled people from receiving a service of equality Improve communication skills thereby enhancing customer care. Raise awareness of the Disability Discrimination Act 1995 and in particular the duties imposed on service providers. Metropole Hotel. 13.10.2006.